As the calendar turns to December, many start thinking ahead to hosting and visiting festive gatherings. At the same time, police and medical workers turn their thoughts toward safety. 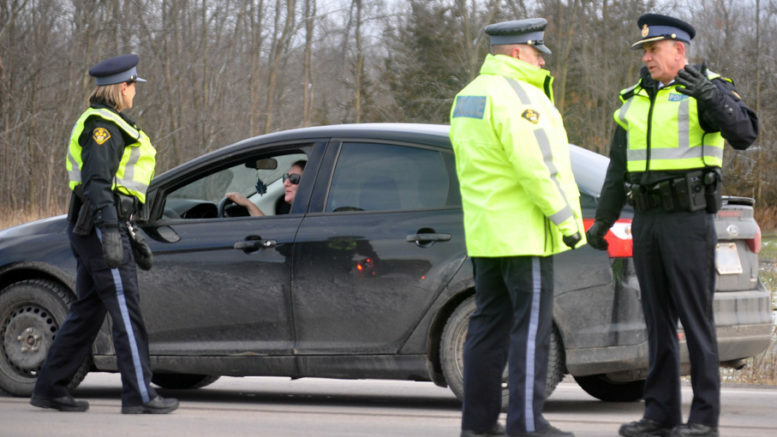 On Thursday, about 20 police officers across the region joined Hastings and Prince Edward medical officer of health Dr. Piotr Oglaza along Hwy 62 north of Hwy 401 to launch the Quinte Region Traffic Coalition’s Festive RIDE (Reduce Impaired Driving Everywhere) campaign for 2018 with a traffic stop and sobriety check. Particularly in light of Canada legalizing cannabis, Oct. 17, Oglaza is reminding motorists that the mix of alcohol and cannabis can be a deadly combination when it comes to impairment. Regardless of the factors of impairment, he’s hopeful residents will make smart choices. Semple said his detachment has a big role in keeping people safe as it polices all of Lennox and Addington County, several roads in Hastings County, and 80 km of Hwy 401. He said officers take that role seriously. “We’re going to be very strategic this holiday season. You’re going to see RIDE programs on the main thoroughfares, but we’re also going to be on those side roads and back roads in areas where people think we’re not going to be,” he said. Semple said police realize that Hwy 401 traffic isn’t just people passing through the area, but it is also a major route for commuters between Kingston and Belleville. With that in mind, he said the OPP will be setting up RIDE checks at off-ramps and it will also be using On Route centres and truck stops. With regard to marijuana, Simple said impairment by drug is not a trend police have been seeing since October, but he suspects as it becomes more mainstream, it could become a bigger concern for police. Prince Edward OPP Staff Sgt. John Hatch said the numbers mete out Semple’s assertion. He said across the OPP’s East Region, there have only been four such charges laid since legalization. Still, he says impairment continues to be an issue, regardless of the source of that impairment. Hatch says the change comes down to personal responsibility. Sgt. Byron Newell of the OPP’s regional Snow-vehicle, All-terrain vehicle and Vessel Enforcement (SAVE) was also on hand to remind the public the same offences and consequences imply for impairment while operating an all-terrain vehicle or a snowmobile on or off the road. He said the OPP will be providing enforcement on area trails this month.